Wishing you a successful, healthy, and joyful new year! For the New Year 2018, you might have prepared a list of resolutions. I would suggest you add one more to your list. Start measuring factory Key Performance Indicators (KPI) (if you are not measuring yet). Start with measuring production floor KPI. 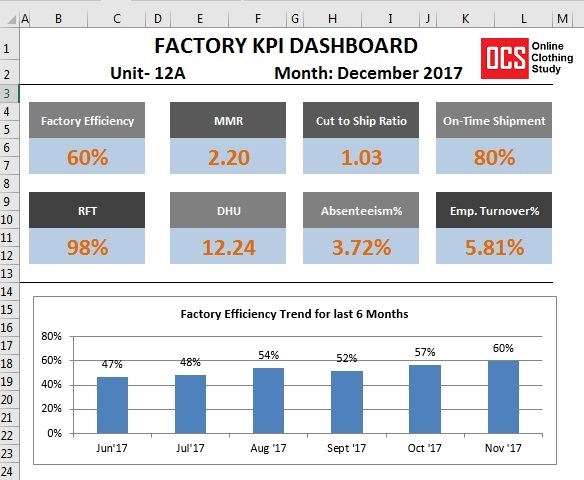 By measuring the factory KPIs, you can see where you stand (factory performance level in various KPIs) and find improvement opportunities you have. From the KPI data, you can define a clear roadmap for this year 2018. I am giving you the KPI measuring excel templates for free as a New Year gift from Online Clothing Study. Download it, copy it and modify the template as you wish. Most important implement it. I am writing tutorial, articles and publishing guides for the garment industry since 2011. Many said a lot of good words about my blog posts, my work, and books. But this is the first time I have seen a factory is practicing my guides, KPI tools and KPI dashboard templates for reporting their factory KPIs. This is the best gift I received in 2017. The factory team is using KPI calculation formula and all listed KPIs included in my eBook and Excel templates. They have further customized the Dashboard and improved its design and layout. According to them, these excel templates are easy to use. They have read the eBook and found all instructions are very clear and are to the point. The said dashboard is still in Excel spreadsheet. But it is very useful for garment factories, who don't have sophisticated ERP software and BI tools. The KPI dashboard template comes with the purchase of my eBook "Garment Maker's KPI: Why measure and how to measure". You can download this file for free until 15th January 2018. Later you need to purchase the eBook to get this template. Don't know how to measure a KPI, how much data you need to measure it, and what KPIs do you need to measure. In my eBook 'Garment maker's KPI', I have listed primary and essential KPIs for garment manufacturers, explained why one needs to measure that KPI and how to measure those KPIs. To use KPI templates you just need MS excel sheet. I hope your computer already have MS Excel. If you have industrial engineers, they can easily measure the listed KPIs by following instructions and looking at data entry sheets. All terms of reference are explained in the eBook. I have shared a presentation on KPI on slideshare.net. You can download that ppt for reading. Again, I am wishing you all a great and successful new year 2018. Make the New Year remarkable by improving your personal relationships and professional life. I will happy reading comments and feedback from you. Here is the free GIFT for you. Download the KPI Excel template, save it and implement it in your factory.